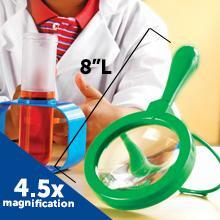 Encourage observation skills with the large, kid-friendly magnifying glass. Safe plastic lens measures 4.5" in diameter, and offers 4.5x magnification. Large 6" test tube is oversized so it’s easy for small hands to hold. Clear plastic lets children see liquids inside. Includes chunky stand and lid. 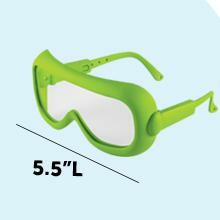 Help children develop the habit of wearing goggles in the science lab with their own colorful, adjustable pair, measuring 5 ½" in length. 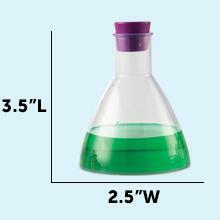 Nothing says 'science lab' like this beaker, in the classic Erlenmeyer flask shape! 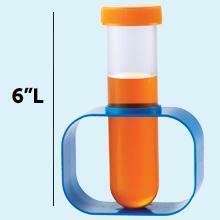 It measures 3.5" x 2.5" (with pouring spout) and holds up to 8 ounces. Includes beaker, magnifying glass, funnel, eyedropper, flask, tweezers, goggles, 1 large test tube (with lid and stand), 2 small test tubes (with lids and stands), plus 10 activity cards. Learning Resources offers a variety of science tools specially designed for little hands and big minds. Our products are easy to use, and easy to clean, giving kids the freedom to play as they learn-everything you hoped for in an educational toy.